...Photographic Ramblings...: Using the Reveal ~ Mono Monday! Using the Reveal ~ Mono Monday! I'm an avid reader. But you probably knew that. I spent much of this weekend, when not editing or enjoying the great weather, catching up on some much anticipated photog related literature. And I was so excited to learn a new approach, and a new phrase, crucial for having the viewer intensely engaged when they see your work and discover it's story. It's called the "reveal"... and it can be powerful. Although I didn't know it had a name, I'd been using it already. The image above is a good example. 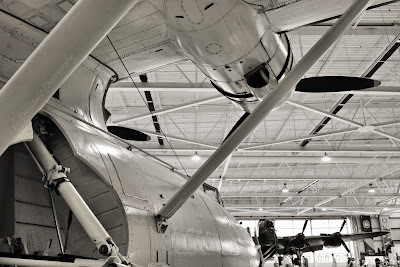 When I composed the shot, I knew I wanted to convey how large and powerful and shapely the Catalina was when you're standing under it at the Warplane Heritage Museum. The plane is the primary subject, very obviously, with the enormous hanger space accentuating it with great lines. But the viewer, after taking in the major part of the image, finally sees one last striking detail... the regal Lancaster Bomber in the background but not as the backdrop. 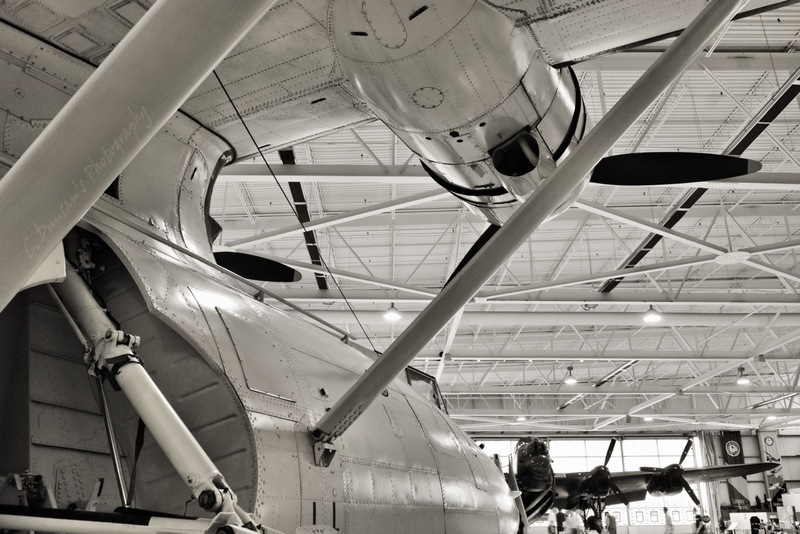 It's positioned relationally to the Catalina Canso PBY-5A, so that at the last minute the viewer spies one more important detail, and is delighted by the discovery. In some instances, the rest of the comp can build towards that last remote but surprising detail. Used by cinematographers and master photographers alike, "the reveal" is a tool that can take everything to a new level. Here's what is required though. More direct intent from the photographer, less "fly by the seat of your pants" thinking. More substance, less "found art" technique. Not that those can't be exciting for both shooter and viewer, but this adds a new dimension that conveys a certain care and intentional process that the audience responds too because instead of everything being laid out for them to take in at once and be done with it, they are asked to contribute to the piece. They are forced to work for the story's completion. This, I learned, is called "The Beholder's Share"... a phrase coined by art historian Ernst Gombrich, (and was quoted in the book I read all weekend). And this excites me, this learning that the viewer doesn't just want to be engaged in the viewing, but wants to work and contribute to what they finally arrive at visually. I contribute this exciting discovery of how to better my craft to the current book I'm studying right now. It's authored by the talented and exceptional Michael Freeman, who's books are fantastic in both practical and artistic ways, and this great read is called "The Photographer's Mind"... if you haven't picked up any one of his many wonderful books, I urge you to do so soon. They're the meat and potatoes of all that's amazing about photography, period. This post was just one way I learned more about my craft, thanks to Freeman's book, and is where I found the Gombrich quote that in my opinion, changes how I see the purposes of visual art. Something I'll be pursuing more of... the reveal, the beholder's share. Hope it inspires some of you as well. Thanks for the ramble folks, have a good one. Really Marvel ~ Exploration Thursday! Beyond A Butterfly ~ Telephoto Tuesday! The Hunt ~ Mono Monday! The Role of Color ~ Floral Friday! Nautical Cyanotype ~ Exploration Thursday! Sailing Away ~ Wide Angle Wednesday! The Candy Store Effect ~ Telephoto Tuesday! Surprise Treasures ~ Mono Monday! Pure Joy ~ Floral Friday! Faded Can Be Beautiful ~ Telephoto Tuesday!